The text of the June 15, 2006 homily of Bishop Ratko Peric was just sent to me, and after confirming authenticity via the Diocese of Mostar-Duvno website, where it is posted in Croatian, English, and Italian, I am going to post it here, in its entirety. The website for Mostar-Duvno is built with some kind of frames that do not allow me to link directly to a specific statement, unless someone can explain how after visiting the site. I will provide the diocesan site at the conclusion, but it will be easiest to read it here, then I will provide a roadmap on how to get it at the bishop's site. This will be a very long post as it is the entire homily. The setting is Confirmation at the Parish of St. James in Medjugorje. He addresses the candidates in the first part, then moves on to discuss Medjugorje in the second part. I know you may be tempted to jump forward, but please read what this man has to say about confirmation itself. It is very rich. Photo Source and related article. You will need to scroll down to find it. Note that there is no mention of the critical 2nd half of the homily. This kind of selective coverage is deceptive to say the least. I speak limited Croatian and attempted to watch the Real Video, but nothing happened when I clicked it. As for the second half, I know this will hurt or anger some people who are very close to Medjugorje. But, what we must keep in mind is that this man is the apostolic successor of the Diocese of Mostar-Duvno and we owe him respect as such. At the very least, his words should be read and reflected upon, not ignored. I pray that Medjugorje websites will offer these words to you, as well, but since that is not likely, I will provide them here. I believe this will be seen in Catholic media in the coming hours, weeks, and months. Dear candidates for Confirmation, I am happy to be with you and your families here today for the conferring of the sacrament of Confirmation. Through the required instruction and the sacrament of Reconciliation you have prepared yourselves to faithfully receive the seven gifts of the Holy Spirit. The gifts of wisdom, understanding, knowledge and counsel, are concerned with our minds, with the enlightening of our use of reason; while the gifts of fortitude, piety and fear of the Lord, regard our hearts and the strengthening of our free will. These are not fleeting gifts that you will joyfully receive today as candidates for Confirmation and which will be gone tomorrow. This is the seal of the gift of the Holy Spirit. Once sealed you always remain sealed with the Holy Spirit! However, each of these gifts requires your efforts in conformity with your growth in knowledge and witnessing through a life of faith. I. - GIFTS OF THE SPIRIT. Hence, be not afraid young friends, to be wise in God’s eyes, even if it means appearing foolish in the eyes of people. God’s “foolishness” is wiser and more prudent than the wisest of people. Do not fear to be strong in God before people, even though the world may consider you cowards and backward. Christ the Lord, God’s Truth, teaches us: "Everyone who acknowledges me before others, I also will acknowledge before my Father in heaven (Mt 10:32). Do not be ashamed to be fearful of the Lord and pious, full of awe towards God and his holiness, even though this passing world may ridicule and mock you. The world has no fear of, nor sense of shame in transgressing God’s commandments. We on the other hand, are believers and worshipers of God, who adore him in spirit and truth. The world counsels on how you can most easily lose yourself in fleeting passions, but the Holy Spirit counsels us on how we can most easily reach eternal life. Whoever then takes truthful counsel, is lead by the Spirit on the right path. The world tempts you and invites you to behave according to its perverted fantasies and passions, yet the Holy Spirit lets you learn and discern by acquiring unending knowledge that leads to the Father’s house. Today, do not allow yourself to just receive the seal on your forehead and then continue living as if you do not possess the Holy Spirit within you. II. - SOLEMNITY OF THE MOST HOLY BODY AND BLOOD OF CHRIST. The Church celebrates today the Solemnity of the Most Holy Body and Blood of Christ. We Catholics believe that the historical event of Jesus’ Last Supper, described in each of the four Gospels, is one of the greatest mysteries of our holy faith. During that evening, the Lord Jesus, while he ate with his disciples, took bread, blessed it, broke the bread and gave it to them saying: “Take; this is my body”. He then took the cup, gave thanks and gave it to them. And all drank from it. “This is my blood of the covenant, which is poured out for many” (Mk 14:22-23). Eucharistic sacrifice. The mystery of the Lord’s Supper is first of all a sign of Jesus’ sacrifice through his death on the cross and resurrection to new life, which he offers us as a divine gift. Why is this at the very core of Christian faith? Because this is what God desired and accomplished! If the all-wise God decided on this path of salvation, then his entire divine intervention is nothing else than wisdom and goodness. We become wise and prudent when we accept this sacrifice as an expression of God’s grace and love. The sacrifice can only be understood and accepted in the context of love. Sacrifice is the most convincing demonstration and evidence of love. God is Love. Therefore, the Eucharistic sacrifice is an expression of God’s love towards us. In a specific historical moment on Calvary, Jesus offered the sacrifice of himself to his Father, as a testimony of his complete Love of God and of humanity. We through our own efforts of piety of heart and mind, participate in the liturgical celebrations and daily offerings of ourselves to God. Eucharistic banquet. This mystery of Jesus’ love is not only his divine sacrifice for us weak people, but it is also our spiritual food for our journey towards eternal life. There is no health, nor life without bread. Mankind does not know all the ingredients of bread and wine, yet he still eats and drinks of them with joy and moderation. Are we even aware of the process of how wheat and grapevines grow? How does a seed sprout or a grape mature? How is the seed transformed into bread, or the grapes into wine? Do we know how bread and wine are then transformed in our living organisms? Despite our lack of knowledge, this does not lessen the strength of bread nor wine to sustain our lives in good health through their nourishment. Something similar occurs with our spiritual health. We cannot understand what the Holy Eucharist is, but we accept it with faith and partake of it with the greatest respect of heart for our eternal salvation. Jesus said to us: “Whoever eats of this bread will live forever” (Jn 6:51). While our earthly bread and wine serve for this life, so too Jesus’ Body and Blood serve for spiritual and eternal life. None of us are worthy of this for we are all sinners: in our thoughts, words and actions, as well as through our omissions in doing the good that we should do. Whoever unworthily eats and drinks of this Sacrament, that is, while in sin, in disorder, in obstinacy, that person is guilty of sinning against the Body and Blood. However, those who confess and repent for their sins, God grants them forgiveness and feeds them with the Body and Blood of Christ. Let us give thanks to God who first of all sets us free from our sins in the sacrament of Confession and who nourishes us with his Eucharistic Body. The Mass is therefore the center of our personal and communal lives. This is the will of our heavenly Father, established by the Son of God, which happens through the power of the Holy Spirit. We believe in the words of Christ, for his words “are spirit and life” (Jn 6:63). In memory of him. The Lord Jesus left us a great divine truth and mystery: “This is my Body”. “This is my Blood”. These words were spoken by Christ himself. From the very beginning, the Church has always literally understood this holy text and message from Jesus’ Last Supper. Not even a single letter has ever been changed, nor have they been understood according to other symbolic meanings in order to make them more acceptable to people. Jesus said these words once and forever! He also commanded that this be done in memory of him! In memory of God’s great works of salvation. We acknowledge and believe in what has been communicated to us! We celebrate the liturgy in the same fashion as we have received it. Let us give thanks to God for the immeasurable gift of Jesus’ Most Holy Body and Blood. This act and mystery contain the past: “Christ has died”; the present of Christ’s resurrection: “Christ has risen”; and the future: “Christ will come again”, when he shall come and prepare a place for us so that we may be where he is (Jn 14:3). III. – “APPARITIONS”. First of all, the fact that a person makes a humble Confession and receives Holy Communion in this parish church and that this person feels spiritually well due to God’s forgiveness, each and every believer will recognize and give due praise to God for this, who is the source of all graces. At the same time, this person will take care not to proceed from this state of grace towards an illogical and inconsistent conclusion: “I made a Confession. I feel good and now I am converted. Therefore the Madonna is appearing in Medjugorje!” This type of believer and penitent is nonetheless obliged to go to confession, receive the other sacraments, observe the Commandments, whether any private apparitions are recognized or not. Secondly, I would be an irresponsible minister of the Mystery of the Body and Blood of Christ, if today I were not to publicly advise, from this place and on this occasion as well, to all those interested throughout the world, that in this local Church of Mostar-Duvno, there exists something similar to a schism. A number of priests that have been expelled from the Franciscan OFM Order by the Generalate of the Order, due to their disobedience to the Holy Father, for years now have been forcefully keeping a few parish churches and rectories along with church inventory. They have not only been illegally active in these parishes, but they have also administered the sacraments profanely, while others invalidly, such as Confession and Confirmation, or they have assisted at invalid marriages. This type of anti-ecclesial behaviour is shocking to all of us. At the same time, this scandal of sacrilegiously administering the sacraments, especially of the Most Holy Body of Christ, must shock all the faithful as well who invalidly confess their sins to these priests and participate in sacrilegious liturgies. We pray to the Lord that this scandal and schism be uprooted as soon as possible from our midst. 1 - Medjugorje is a catholic parish in which liturgical and pastoral activities are carried out, just as in all the other parishes of this diocese of Mostar-Duvno. No-one except the official Church authorities is then authorized to attribute the formal title of “shrine” to this place. 2 - On the basis of Church investigations of the events of Medjugorje, it cannot be determined that these events involve supernatural apparitions or revelations. This means that till now the Church has not accepted, neither as supernatural nor as Marian, any of the apparitions. 3 - Priests who canonically administer this parish of Medjugorje or those who come as visitors, are not authorised to express their private views contrary to the official position of the Church on the so-called “apparitions” and “messages”, during celebrations of the sacraments, neither during other common acts of piety, nor in the Catholic media. 4 - The Catholic faithful are not only free from any obligation to believe in the authenticity of the “apparitions” but they must also know that church pilgrimages are not allowed, whether official or private, individual or group, or from other parishes, if they presuppose the authenticity of the “apparitions” or if by undertaking them attempt to certify these “apparitions”. The remaining two will receive the same, every day along with “messages” that can be anticipated since they are variations on the same theme. This fact and the flood of so-called apparitions, messages, secrets and signs, do not strengthen the faith, but rather further convince us that in all of this there is nothing neither authentic nor established as truthful. Therefore I responsibly call upon those who claim themselves to be “seers”, as well as those persons behind the “messages”, to demonstrate ecclesiastical obedience and to cease with these public manifestations and messages in this parish. In this fashion they shall show their necessary adherence to the Church, by neither placing private “apparitions” nor private sayings before the official position of the Church. Our faith is a serious and responsible matter. The Church is also a serious and responsible institution! Through the intercession of the Blessed Virgin Mary, the greatest possessor of the gifts of the Holy Spirit, who through the same Holy Spirit conceived in her body and gave birth to the Second person of the Trinity, Jesus Christ, who gives us his Most Holy Body and Blood for eternal life, may He - who is the Way, the Truth and the Life – help us so that the truth of the Blessed Virgin, his Mother and Mother of the Church, Seat of Wisdom and Mirror of Justice, may shine forth in brightness in this parish and diocese, without even a hint of incredibility, yet all in accord with the constant teachings and practice of the Church. Amen. I've maintained for some time now, that the messages themselves are a "forbidden fruit". As far back as 1984, preceeding Ordinary, Bishop Zanic (deceased) ordered in writing that messages cease being made public. Each message read over the last 25 years, is a message that was obtained through an act of disobedience to that order by the competent authority. The Blessed Mother being a model of such obedience would surely have encouraged the "seers" to humbly follow the orders of the Bishop and extraordinary virtue would have been visible had they complied with the directive. There is no doubt that many have been brought to the faith through Medjugorje. Medjugorje has yielded many vocations. But was it truly an apparition which yielded these fruits, or was it the grace of God coming through the sacraments, especially the Eucharist and Confession? I am in a parish right now, where these two things are highly valued - just scroll through the blog to see photos. Many who come to this blog yearn for these things in their own parish so why not provide them? I have no need to make a pilgrimage half-way across the world because my pastoral needs are met through the hard work of priests who nurture the many things valued by Catholics who frequent Medjugorje: Eucharist, adoration, benediction, devotions, rosary, silent meditation, frequent confession, mortification, etc. Priests need to bring these things to all parishes because Medjugorje proves without a doubt that the faithful want them - including non-Catholics who go there and are converted. It has proven without a doubt that these things lead to vocations. 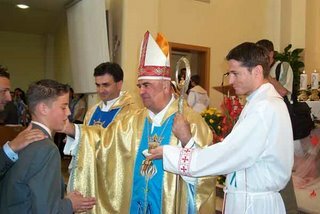 We should all pray for Bishop Peric, the Holy See, the "seers", and the followers of Medjugorje - that God's will be done in all things pertaining to Medjugorje. One of the best thought processes I've seen, very abbreviated was written by Bishop Henri Brincard of the French Bishop's Commission on Medjugorje, written in 2002. Carefully, jurisdiction is laid out, various claims are explored and addressed, with regards to that jurisdiction. The need to see the "events" ahead of judging the fruits is looked at, as well, along with the need to balance good fruits, and bad fruits. The latter simply cannot be ignored because good things are happening. Just as we need to be careful with how closely we attach ourselves to any one priest, we must constantly evaluate what we are basing our faith on. Is it the sacraments? Or, is it a favored priest? Is it an apparition, or set of miracles or messages? Can our faith stand if a favored priest moves on, or without a phenomena such as that offered at Medjugorje? Parish priests must explore what pulls people to Medjugorje, then offer it right in their own parish, and I don't mean apparitions or "seers". If you would like to see this on the Bishop's website, in English, Italian or Croatian, please click the link below. When you get there, click on Medjugorje, then scroll through the frame on the right until you see the title with this in it: MEDJUGORJE, 15 - VI - 2006. Note: There is no chronological order that I can see, in how the documents line up in this frame window. So, just keep scrolling. NEW on JULY 23: "Surprise from the Vatican: Hole See takes Medjugorje Phenomenon into its own hands"
What truly leads people to Medjugorje? What leads people to Medjugorje?